Duloxetine with NDC 70518-1891 is a a human prescription drug product labeled by Remedyrepack Inc.. 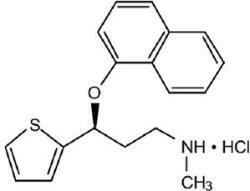 The generic name of Duloxetine is duloxetine. The product's dosage form is capsule, delayed release pellets and is administered via oral form. Dosage Form: Capsule, Delayed Release Pellets - A solid dosage form in which the drug is enclosed within either a hard or soft soluble container or "shell" made from a suitable form of gelatin; the drug itself is in the form of granules to which enteric coating has been applied, thus delaying release of the drug until its passage into the intestines. FDA Application Number: ANDA090776 What is the FDA Application Number? ® (duloxetine) delayed-release capsules. However, due to Eli Lilly and Company, Inc.'s marketing exclusivity rights, this drug product is not labeled with that pediatric information.
. For patients for whom tolerability is a concern, a lower starting dose may be considered. Families and caregivers of patients being treated with antidepressants for major depressive disorder or other indications, both psychiatric and nonpsychiatric, should be alerted about the need to monitor patients for the emergence of agitation, irritability, unusual changes in behavior, and the other symptoms described above, as well as the emergence of suicidality, and to report such symptoms immediately to health care providers. Such monitoring should include daily observation by families and caregivers. Prescriptions for duloxetine delayed-release capsulesshould be written for the smallest quantity of capsules consistent with good patient management, in order to reduce the risk of overdose.Screening Patients for Bipolar Disorder - A major depressive episode may be the initial presentation of bipolar disorder. It is generally believed (though not established in controlled trials) that treating such an episode with an antidepressant alone may increase the likelihood of precipitation of a mixed/manic episode in patients at risk for bipolar disorder. Whether any of the symptoms described above represent such a conversion is unknown. However, prior to initiating treatment with an antidepressant, patients with depressive symptoms should be adequately screened to determine if they are at risk for bipolar disorder; such screening should include a detailed psychiatric history, including a family history of suicide, bipolar disorder, and depression. It should be noted that duloxetine delayed-release capsules are not approved for use in treating bipolar depression. There have been reports of hepatic failure, sometimes fatal, in patients treated with duloxetine delayed-release capsules. These cases have presented as hepatitis with abdominal pain, hepatomegaly, and elevation of transaminase levels to more than twenty times the upper limit of normal with or without jaundice, reflecting a mixed or hepatocellular pattern of liver injury. Duloxetine delayed-release capsules should be discontinued in patients who develop jaundice or other evidence of clinically significant liver dysfunction and should not be resumed unless another cause can be established.Cases of cholestatic jaundice with minimal elevation of transaminase levels have also been reported. Other postmarketing reports indicate that elevated transaminases, bilirubin, and alkaline phosphatase have occurred in patients with chronic liver disease or cirrhosis.Duloxetine delayed-release capsules increased the risk of elevation of serum transaminase levels in development program clinical trials. Liver transaminase elevations resulted in the discontinuation of 0.3% (92/34,756) of duloxetine delayed-release capsule-treated patients. In most patients, the median time to detection of the transaminase elevation was about two months. In adult placebo-controlled trials in any indication, for patients with normal and abnormal baseline ALT values, elevation of ALT greater than 3 times the upper limit of normal occurred in 1.25% (144/11,496) of duloxetine delayed-release capsule-treated patients compared to 0.45% (39/8716) of placebo-treated patients. In adult placebo-controlled studies using a fixed dose design, there was evidence of a dose response relationship for ALT and AST elevation of greater than 3 times the upper limit of normal and greater than 5 times the upper limit of normal, respectively.Because it is possible that duloxetine delayed-release capsules and alcohol may interact to cause liver injury or that duloxetine delayed-release capsules may aggravate pre-existing liver disease, duloxetine delayed-release capsules should not be prescribed to patients with substantial alcohol use or evidence of chronic liver disease. and in patients taking duloxetine delayed-release capsules at doses above 60 mg daily. Consideration should be given to dose reduction or discontinuation of duloxetine delayed-release capsules in patients who experience symptomatic orthostatic hypotension, falls and/or syncope during duloxetine delayed-release capsules therapy. If concomitant use of duloxetine delayed-release capsules with other serotonergic drugs including triptans, tricyclic antidepressants, fentanyl, lithium, tramadol, buspirone, tryptophan, amphetamines, and St. John’s Wort is clinically warranted, patients should be made aware of a potential increased risk for serotonin syndrome, particularly during treatment initiation and dose increases. Treatment with duloxetine delayed-release capsules and any concomitant serotonergic agents, should be discontinued immediately if the above events occur and supportive symptomatic treatment should be initiated. SSRIs and SNRIs, including duloxetine delayed-release capsules, may increase the risk of bleeding events. Concomitant use of aspirin, nonsteroidal anti-inflammatory drugs, warfarin, and other anti-coagulants may add to this risk. Case reports and epidemiological studies (case-control and cohort design) have demonstrated an association between use of drugs that interfere with serotonin reuptake and the occurrence of gastrointestinal bleeding. Bleeding events related to SSRIs and SNRIs use have ranged from ecchymoses, hematomas, epistaxis, and petechiae to life-threatening hemorrhages.Patients should be cautioned about the risk of bleeding associated with the concomitant use of duloxetine delayed-release capsules and NSAIDs, aspirin, or other drugs that affect coagulation. Severe skin reactions, including erythema multiforme and Stevens-Johnson Syndrome (SJS), can occur with duloxetine delayed-release capsules. The reporting rate of SJS associated with duloxetine delayed-release capsules use exceeds the general population background incidence rate for this serious skin reaction (1 to 2 cases per million person years). The reporting rate is generally accepted to be an underestimate due to underreporting.Duloxetine delayed-release capsules should be discontinued at the first appearance of blisters, peeling rash, mucosal erosions, or any other sign of hypersensitivity if no other etiology can be identified. In adult placebo-controlled trials in patients with major depressive disorder, activation of mania or hypomania was reported in 0.1% (4/3779) of duloxetine delayed-release capsule-treated patients and 0.04% (1/2536) of placebo-treated patients. No activation of mania or hypomania was reported in DPNP, GAD, fibromyalgia, or chronic musculoskeletal pain placebo-controlled trials. Activation of mania or hypomania has been reported in a small proportion of patients with mood disorders who were treated with other marketed drugs effective in the treatment of major depressive disorder. As with these other agents, duloxetine delayed-release capsules should be used cautiously in patients with a history of mania. The pupillary dilation that occurs following use of many antidepressant drugs including duloxetine delayed-release capsules may trigger an angle closure attack in a patient with anatomically narrow angles who does not have a patent iridectomy. Duloxetine delayed-release capsules have not been systematically evaluated in patients with a seizure disorder, and such patients were excluded from clinical studies. In adult placebo-controlled clinical trials, seizures/convulsions occurred in 0.02% (3/12,722) of patients treated with duloxetine delayed-release capsules and 0.01% (1/9513) of patients treated with placebo. Duloxetine delayed-release capsules should be prescribed with care in patients with a history of a seizure disorder.
. Discontinuation of duloxetine delayed-release capsules should be considered in patients with symptomatic hyponatremia and appropriate medical intervention should be instituted. 1c increased by 0.5% in the duloxetine delayed-release capsule group and by 0.2% in the routine care groups. Duloxetine delayed-release capsules are in a class of drugs known to affect urethral resistance. If symptoms of urinary hesitation develop during treatment with duloxetine delayed-release capsules, consideration should be given to the possibility that they might be drug-related.In postmarketing experience, cases of urinary retention have been observed. In some instances of urinary retention associated with duloxetine delayed-release capsule use, hospitalization and/or catheterization has been needed. Major Depressive Disorder - Approximately 8.4% (319/3779) of the patients who received duloxetine delayed-release capsules in placebo-controlled trials for MDD discontinued treatment due to an adverse reaction, compared with 4.6% (117/2536) of the patients receiving placebo. Nausea (duloxetine delayed-release capsules 1.1%, placebo 0.4%) was the only common adverse reaction reported as a reason for discontinuation and considered to be drug-related (i.e., discontinuation occurring in at least 1% of the duloxetine delayed-release capsule-treated patients and at a rate of at least twice that of placebo). Generalized Anxiety Disorder - Approximately 13.7% (139/1018) of the patients who received duloxetine delayed-release capsules in placebo-controlled trials for GAD discontinued treatment due to an adverse reaction, compared with 5.0% (38/767) for placebo. Common adverse reactions reported as a reason for discontinuation and considered to be drug-related (as defined above) included nausea (duloxetine delayed-release capsules 3.3%, placebo 0.4%), and dizziness (duloxetine delayed-release capsules 1.3%, placebo 0.4%). Diabetic Peripheral Neuropathic Pain - Approximately 12.9% (117/906) of the patients who received duloxetine delayed-release capsules in placebo-controlled trials for DPNP discontinued treatment due to an adverse reaction, compared with 5.1% (23/448) for placebo. Common adverse reactions reported as a reason for discontinuation and considered to be drug-related (as defined above) included nausea (duloxetine delayed-release capsules 3.5%, placebo 0.7%), dizziness (duloxetine delayed-release capsules 1.2%, placebo 0.4%), and somnolence (duloxetine delayed-release capsules 1.1%, placebo 0.0%). Fibromyalgia - Approximately 17.5% (227/1294) of the patients who received duloxetine delayed-release capsules in 3 to 6 month placebo-controlled trials for FM discontinued treatment due to an adverse reaction, compared with 10.1% (96/955) for placebo. Common adverse reactions reported as a reason for discontinuation and considered to be drug-related (as defined above) included nausea (duloxetine delayed-release capsules 2.0%, placebo 0.5%), headache (duloxetine delayed-release capsules 1.2%, placebo 0.3%), somnolence (duloxetine delayed-release capsules 1.1%, placebo 0.0%), and fatigue (duloxetine delayed-release capsules 1.1%, placebo 0.1%). Chronic Pain due to Osteoarthritis - Approximately 15.7% (79/503) of the patients who received duloxetine delayed-release capsules in 13-week, placebo-controlled trials for chronic pain due to OA discontinued treatment due to an adverse reaction, compared with 7.3% (37/508) for placebo. Common adverse reactions reported as a reason for discontinuation and considered to be drug-related (as defined above) included nausea (duloxetine delayed-release capsules 2.2%, placebo 1.0%). Chronic Low Back Pain - Approximately 16.5% (99/600) of the patients who received duloxetine delayed-release capsules in 13-week, placebo-controlled trials for CLBP discontinued treatment due to an adverse reaction, compared with 6.3% (28/441) for placebo. Common adverse reactions reported as a reason for discontinuation and considered to be drug-related (as defined above) included nausea (duloxetine delayed-release capsules 3.0%, placebo 0.7%), and somnolence (duloxetine delayed-release capsules 1.0%, placebo 0.0%). Pooled Trials for all Approved Indications - The most commonly observed adverse reactions in duloxetine delayed-release capsule-treated patients (incidence of at least 5% and at least twice the incidence in placebo patients) were nausea, dry mouth, somnolence, constipation, decreased appetite, and hyperhidrosis. Diabetic Peripheral Neuropathic Pain - The most commonly observed adverse reactions in duloxetine delayed-release capsule-treated patients (as defined above) were nausea, somnolence, decreased appetite, constipation, hyperhidrosis, and dry mouth. Fibromyalgia - The most commonly observed adverse reactions in duloxetine delayed-release capsule-treated patients (as defined above) were nausea, dry mouth, constipation, somnolence, decreased appetite, hyperhidrosis, and agitation. Chronic Pain due to Osteoarthritis - The most commonly observed adverse reactions in duloxetine delayed-release capsule-treated patients (as defined above) were nausea, fatigue, constipation, dry mouth, insomnia, somnolence, and dizziness. Chronic Low Back Pain - The most commonly observed adverse reactions in duloxetine delayed-release capsule-treated patients (as defined above) were nausea, dry mouth, insomnia, somnolence, constipation, dizziness, and fatigue. f54a The inclusion of an event in the table is determined based on the percentages before rounding; however, the percentages displayed in the table are rounded to the nearest integer. Pooled MDD and GAD Trials - Table 3 gives the incidence of treatment-emergent adverse reactions in MDD and GAD placebo-controlled trials for approved indications that occurred in 2% or more of patients treated with duloxetine delayed-release capsules and with an incidence greater than placebo. j2<1Respiratory, Thoracic, and Mediastinal DisordersYawning2<1Skin and Subcutaneous Tissue DisordersHyperhidrosis62a The inclusion of an event in the table is determined based on the percentages before rounding; however, the percentages displayed in the table are rounded to the nearest integer. DPNP, FM, OA, and CLBP - Table 4 gives the incidence of treatment-emergent adverse events that occurred in 2% or more of patients treated with duloxetine delayed-release capsules (determined prior to rounding) in the premarketing acute phase of DPNP, FM, OA, and CLBP placebo-controlled trials and with an incidence greater than placebo. l21a The inclusion of an event in the table is determined based on the percentages before rounding; however, the percentages displayed in the table are rounded to the nearest integer. Duloxetine delayed-release capsules treatment, for up to 26 weeks in placebo-controlled trials across approved indications, typically caused a small increase in heart rate for change from baseline to endpoint compared to placebo of up to 1.37 beats per minute (increase of 1.20 beats per minute in duloxetine delayed-release capsule-treated patients, decrease of 0.17 beats per minute in placebo-treated patients).
. High bicarbonate, cholesterol, and abnormal (high or low) potassium, were observed more frequently in duloxetine delayed-release capsule-treated patients compared to placebo. The effect of duloxetine delayed-release capsules 160 mg and 200 mg administered twice daily to steady state was evaluated in a randomized, double-blinded, two-way crossover study in 117 healthy female subjects. No QT interval prolongation was detected. Duloxetine delayed-release capsules appear to be associated with concentration-dependent but not clinically meaningful QT shortening. Infrequent: myocardial infarction, tachycardia, and Takotsubo cardiomyopathy. Infrequent: ear pain and tinnitus. Infrequent: diplopia, dry eye, and visual impairment. Infrequent: muscle tightness and muscle twitching. Infrequent: dysuria, micturition urgency, nocturia, polyuria, and urine odor abnormal. Infrequent: flushing, orthostatic hypotension, and peripheral coldness. f74Respiratory, Thoracic, and Mediastinal DisordersOropharyngeal Pain42Cough31a The inclusion of an event in the table is determined based on the percentages before rounding; however, the percentages displayed in the table are rounded to the nearest integer. d Frequency based on weight measurement meeting potentially clinically significant threshold of greater than or equal to 3.5% weight loss (N=467 duloxetine delayed-release capsules; N=354 Placebo). Growth (Height and Weight) - Decreased appetite and weight loss have been observed in association with the use of SSRIs and SNRIs. In studies up to 9 months, duloxetine delayed-release capsule-treated pediatric patients experienced an increase in height of 1.7 cm on average (2.2 cm increase in children [7 to 11 years of age] and 1.3 cm increase in adolescents [12 to 17 years of age]). While height increase was observed during these studies, a mean decrease of 1% in height percentile was observed (decrease of 2% in children [7 to 11 years of age] and increase of 0.3% in adolescents [12 to 17 years of age]). Weight and height should be monitored regularly in children and adolescents treated with duloxetine delayed-release capsules. The following adverse reactions have been identified during post approval use of duloxetine delayed-release capsules. Because these reactions are reported voluntarily from a population of uncertain size, it is not always possible to reliably estimate their frequency or establish a causal relationship to drug exposure.Adverse reactions reported since market introduction that were temporally related to duloxetine delayed-release capsules therapy and not mentioned elsewhere in labeling include: acute pancreatitis, anaphylactic reaction, aggression and anger (particularly early in treatment or after treatment discontinuation), angioneurotic edema, angle-closure glaucoma, colitis (microscopic or unspecified), cutaneous vasculitis (sometimes associated with systemic involvement), extrapyramidal disorder, galactorrhea, gynecological bleeding, hallucinations, hyperglycemia, hyperprolactinemia, hypersensitivity, hypertensive crisis, muscle spasm, rash, restless legs syndrome, seizures upon treatment discontinuation, supraventricular arrhythmia, tinnitus (upon treatment discontinuation), trismus, and urticaria. Both CYP1A2 and CYP2D6 are responsible for duloxetine hydrochloride metabolism. Under steady-state conditions for duloxetine (60 mg Q 12 hours) and lorazepam (2 mg Q 12 hours), the pharmacokinetics of duloxetine were not affected by coadministration. Under steady-state conditions for duloxetine (20 mg qhs) and temazepam (30 mg qhs), the pharmacokinetics of duloxetine were not affected by coadministration. in vitro studies, and in two clinical studies the average (90% confidence interval) increase in theophylline AUC was 7% (1% to 15%) and 20% (13% to 27%) when coadministered with duloxetine (60 mg twice daily). in vitro studies demonstrate that duloxetine does not inhibit or induce CYP3A activity. Therefore, an increase or decrease in the metabolism of CYP3A substrates (e.g., oral contraceptives and other steroidal agents) resulting from induction or inhibition is not anticipated, although clinical studies have not been performed. in vitro studies demonstrate that duloxetine does not inhibit CYP2C19 activity at therapeutic concentrations. Inhibition of the metabolism of CYP2C19 substrates is therefore not anticipated, although clinical studies have not been performed. Pregnancy Category CRisk Summary - There are no adequate and well-controlled studies of duloxetine delayed-release capsules administration in pregnant women. In animal studies with duloxetine, fetal weights were decreased but there was no evidence of teratogenicity in pregnant rats and rabbits at oral doses administered during the period of organogenesis up to 4 and 7 times the maximum recommended human dose (MRHD) of 120 mg/day, respectively. When duloxetine was administered orally to pregnant rats throughout gestation and lactation, pup weights at birth and pup survival to 1 day postpartum were decreased at a dose 2 times the MRHD. At this dose, pup behaviors consistent with increased reactivity, such as increased startle response to noise and decreased habituation of locomotor activity were observed. Post-weaning growth was not adversely affected. Duloxetine delayed-release capsules should be used in pregnancy only if the potential benefit justifies the potential risk to the fetus. DataAnimal Data - In animal reproduction studies, duloxetine has been shown to have adverse effects on embryo/fetal and postnatal development. 2 basis, in rat; 7 times the MRHD in rabbit). However, fetal weights were decreased at this dose, with a no-effect dose of 10 mg/kg/day approximately equal to the MRHD in rats; 2 times the MRHD in rabbits). Risk SummaryDuloxetine hydrochloride is present in human milk. In a published study, lactating women who were weaning their infants were given duloxetine delayed-release capsules. At steady state, the concentration of duloxetine hydrochloride in breast milk was approximately 25% that of maternal plasma. The estimated daily infant dose was approximately 0.14% of the maternal dose. The developmental and health benefits of human milk feeding should be considered along with the mother’s clinical need for duloxetine delayed-release capsules and any potential adverse effects on the milk-fed child from the drug or from the underlying maternal condition. Exercise caution when duloxetine delayed-release capsules are administered to a nursing woman.DataThe disposition of duloxetine delayed-release capsules was studied in 6 lactating women who were at least 12 weeks postpartum and had elected to wean their infants. The women were given 40 mg of duloxetine delayed-release capsules twice daily for 3.5 days. The peak concentration measured in breast milk occurred at a median of 3 hours after the dose. The amount of duloxetine hydrochloride in breast milk was approximately 7 mcg/day while on that dose; the estimated daily infant dose was approximately 2 mcg/kg/day. The presence of duloxetine hydrochloride metabolites in breast milk was not examined. ® (duloxetine) delayed-release capsules. However, due to Eli Lilly and Company, Inc.’s marketing exclusivity rights, this drug product is not labeled with that pediatric information. In animal studies, duloxetine did not demonstrate barbiturate-like (depressant) abuse potential.While duloxetine delayed-release capsules have not been systematically studied in humans for their potential for abuse, there was no indication of drug-seeking behavior in the clinical trials. However, it is not possible to predict on the basis of premarketing experience the extent to which a CNS active drug will be misused, diverted, and/or abused once marketed. Consequently, physicians should carefully evaluate patients for a history of drug abuse and follow such patients closely, observing them for signs of misuse or abuse of duloxetine delayed-release capsules (e.g., development of tolerance, incrementation of dose, drug-seeking behavior). In postmarketing experience, fatal outcomes have been reported for acute overdoses, primarily with mixed overdoses, but also with duloxetine only, at doses as low as 1,000 mg. Signs and symptoms of overdose (duloxetine alone or with mixed drugs) included somnolence, coma, serotonin syndrome, seizures, syncope, tachycardia, hypotension, hypertension, and vomiting. max by an average of one-third, although some subjects had a limited effect of activated charcoal. Due to the large volume of distribution of this drug, forced diuresis, dialysis, hemoperfusion, and exchange transfusion are unlikely to be beneficial. Duloxetine hydrochloride, USP is a white to slightly brownish white solid, which is slightly soluble in water.Each capsule contains enteric-coated pellets of 22.4, 33.7, or 67.3 mg of duloxetine hydrochloride, USP equivalent to 20, 30, or 60 mg of duloxetine, respectively. These enteric-coated pellets are designed to prevent degradation of the drug in the acidic environment of the stomach. Inactive ingredients include ammonium hydroxide, black iron oxide, gelatin, hydroxypropyl cellulose, hydroxypropyl methylcellulose phthalate, hypromellose, potassium hydroxide, propylene glycol, shellac, sugar spheres (which contain sucrose and corn starch), talc, titanium dioxide, and triethyl citrate. The 20 mg and 30 mg capsules also contain FD&C Blue #1 Aluminum Lake. in vitro. Duloxetine does not inhibit monoamine oxidase (MAO). max of duloxetine, but delays the time to reach peak concentration from 6 to 10 hours and it marginally decreases the extent of absorption (AUC) by about 10%. There is a 3 hour delay in absorption and a one-third increase in apparent clearance of duloxetine after an evening dose as compared to a morning dose. 1-acid glycoprotein. The interaction between duloxetine and other highly protein bound drugs has not been fully evaluated. Plasma protein binding of duloxetine is not affected by renal or hepatic impairment. in vitro. Metabolites found in plasma include 4-hydroxy duloxetine glucuronide and 5-hydroxy, 6-methoxy duloxetine sulfate. Many additional metabolites have been identified in urine, some representing only minor pathways of elimination. Only trace (less than 1% of the dose) amounts of unchanged duloxetine are present in the urine. Most (about 70%) of the duloxetine dose appears in the urine as metabolites of duloxetine; about 20% is excreted in the feces. Duloxetine undergoes extensive metabolism, but the major circulating metabolites have not been shown to contribute significantly to the pharmacologic activity of duloxetine. Carcinogenesis - Duloxetine was administered in the diet to mice and rats for 2 years. 2 basis), there was an increased incidence of hepatocellular adenomas and carcinomas. The no-effect dose was 50 mg/kg/day (2 times the MRHD). Tumor incidence was not increased in male mice receiving duloxetine at doses up to 100 mg/kg/day (4 times the MRHD). Impairment of Fertility - Duloxetine administered orally to either male or female rats prior to and throughout mating at doses up to 45 mg/kg/day (4 times the MRHD) did not alter mating or fertility. b20.2 (3.41)-12.1 (0.49)-3.3 (-4.7, -1.9)Placebo19.9 (3.58)-8.8 (0.50)--SD: standard deviation; SE: standard error; LS Mean: least-squares mean; CI: confidence interval, not adjusted for multiplicity in trials where multiple dose groups were included.aDifference (drug minus placebo) in least-squares mean change from baseline. In another study, 533 patients meeting DSM-IV criteria for MDD received duloxetine delayed-release capsules 60 mg once daily during an initial 12-week open-label treatment phase. Two hundred and seventy-eight patients who responded to open label treatment (defined as meeting the following criteria at weeks 10 and 12: a HAMD-17 total score less than or equal to 9, Clinical Global Impressions of Severity (CGI-S) less than or equal to 2, and not meeting the DSM-IV criteria for MDD) were randomly assigned to continuation of duloxetine delayed-release capsules at the same dose (N=136) or to placebo (N=142) for 6 months. Patients on duloxetine delayed-release capsules experienced a statistically significantly longer time to relapse of depression than did patients on placebo (Study 5 in Figure 1). Relapse was defined as an increase in the CGI-S score of greater than or equal to 2 points compared with that obtained at week 12, as well as meeting the DSM-IV criteria for MDD at 2 consecutive visits at least 2 weeks apart, where the 2-week temporal criterion had to be satisfied at only the second visit. The effectiveness of duloxetine delayed-release capsules in hospitalized patients with major depressive disorder has not been studied. The efficacy of duloxetine delayed-release capsules for the management of neuropathic pain associated with diabetic peripheral neuropathy was established in 2 randomized, 12-week, double-blind, placebo-controlled, fixed-dose studies in adult patients having diabetic peripheral neuropathic pain for at least 6 months. Study DPNP-1 and Study DPNP-2 enrolled a total of 791 patients of whom 592 (75%) completed the studies. Patients enrolled had Type I or II diabetes mellitus with a diagnosis of painful distal symmetrical sensorimotor polyneuropathy for at least 6 months. The patients had a baseline pain score of greater than or equal to 4 on an 11-point scale ranging from 0 (no pain) to 10 (worst possible pain). Patients were permitted up to 4 g of acetaminophen per day as needed for pain, in addition to duloxetine delayed-release capsules. 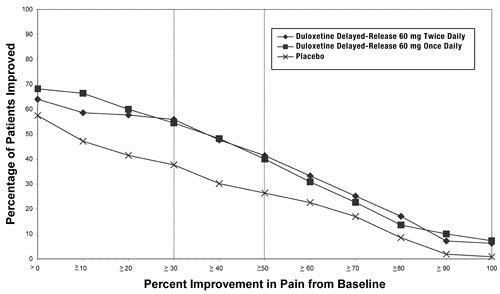 Patients recorded their pain daily in a diary.Both studies compared duloxetine delayed-release capsules 60 mg once daily or 60 mg twice daily with placebo. DPNP-1 additionally compared duloxetine delayed-release capsules 20 mg with placebo. A total of 457 patients (342 duloxetine delayed-release capsules, 115 placebo) were enrolled in DPNP-1 and a total of 334 patients (226 duloxetine delayed-release capsules, 108 placebo) were enrolled in DPNP-2. Treatment with duloxetine delayed-release capsules 60 mg one or two times a day statistically significantly improved the endpoint mean pain scores from baseline and increased the proportion of patients with at least a 50% reduction in pain scores from baseline. For various degrees of improvement in pain from baseline to study endpoint, Figures 3 and 4 show the fraction of patients achieving that degree of improvement. The figures are cumulative, so that patients whose change from baseline is, for example, 50%, are also included at every level of improvement below 50%. Patients who did not complete the study were assigned 0% improvement. Some patients experienced a decrease in pain as early as week 1, which persisted throughout the study. The efficacy of duloxetine delayed-release capsules for the management of fibromyalgia was established in two randomized, double-blind, placebo-controlled, fixed-dose studies in adult patients meeting the American College of Rheumatology criteria for fibromyalgia (a history of widespread pain for 3 months, and pain present at 11 or more of the 18 specific tender point sites). Study FM-1 was three months in duration and enrolled female patients only. Study FM-2 was six months in duration and enrolled male and female patients. Approximately 25% of participants had a comorbid diagnosis of major depressive disorder (MDD). FM-1 and FM-2 enrolled a total of 874 patients of whom 541 (62%) completed the studies. The patients had a baseline pain score of 6.5 on an 11-point scale ranging from 0 (no pain) to 10 (worse possible pain).Both studies compared duloxetine delayed-release capsules 60 mg once daily or 120 mg daily (given in divided doses in FM-1 and as a single daily dose in FM-2) with placebo. FM-2 additionally compared duloxetine delayed-release capsules 20 mg with placebo during the initial three months of a six-month study. A total of 354 patients (234 duloxetine delayed-release capsules, 120 placebo) were enrolled in FM-1 and a total of 520 patients (376 duloxetine delayed-release capsules, 144 placebo) were enrolled in FM-2 (5% male, 95% female). Treatment with duloxetine delayed-release capsules 60 mg or 120 mg daily statistically significantly improved the endpoint mean pain scores from baseline and increased the proportion of patients with at least a 50% reduction in pain score from baseline. Pain reduction was observed in patients both with and without comorbid MDD. However, the degree of pain reduction may be greater in patients with comorbid MDD. For various degrees of improvement in pain from baseline to study endpoint, Figures 5 and 6 show the fraction of patients achieving that degree of improvement. The figures are cumulative so that patients whose change from baseline is, for example, 50%, are also included at every level of improvement below 50%. Patients who did not complete the study were assigned 0% improvement. Some patients experienced a decrease in pain as early as week 1, which persisted throughout the study. Improvement was also demonstrated on measures of function (Fibromyalgia Impact Questionnaires) and patient global impression of change (PGI). Neither study demonstrated a benefit of 120 mg compared to 60 mg, and a higher dose was associated with more adverse reactions and premature discontinuations of treatment.Additionally, the benefit of up-titration in non-responders to duloxetine delayed-release capsules at 60 mg/day was evaluated in a separate study. Patients were initially treated with duloxetine delayed-release capsules 60 mg once daily for eight weeks in open-label fashion.Subsequently, completers of this phase were randomized to double-blind treatment with duloxetine delayed-release capsules at either 60 mg once daily or 120 mg once daily. Those patients who were considered non-responders, where response was defined as at least a 30% reduction in pain score from baseline at the end of the 8-week treatment, were no more likely to meet response criteria at the end of 60 weeks of treatment if blindly titrated to duloxetine delayed-release capsules 120 mg as compared to those who were blindly continued on duloxetine delayed-release capsules 60 mg.
Duloxetine delayed-release capsules are indicated for the management of chronic musculoskeletal pain. This has been established in studies in patients with chronic low back pain and chronic pain due to osteoarthritis.Studies in Chronic Low Back PainThe efficacy of duloxetine delayed-release capsules in chronic low back pain (CLBP) was assessed in two double-blind, placebo-controlled, randomized clinical trials of 13-weeks duration (Study CLBP-1 and Study CLBP-2), and one of 12-weeks duration (CLBP-3). CLBP-1 and CLBP-3 demonstrated efficacy of duloxetine delayed-release capsules in the treatment of chronic low back pain. Patients in all studies had no signs of radiculopathy or spinal stenosis.Study CLBP-1: Two hundred thirty-six adult patients (N=115 on duloxetine delayed-release capsules, N=121 on placebo) enrolled and 182 (77%) completed 13-week treatment phase. After 7 weeks of treatment, duloxetine delayed-release capsules patients with less than 30% reduction in average daily pain and who were able to tolerate duloxetine delayed-release capsules 60 mg once daily had their dose of duloxetine delayed-release capsules, in a double-blinded fashion, increased to 120 mg once daily for the remainder of the study. Patients had a mean baseline pain rating of 6 on a numerical rating scale ranging from 0 (no pain) to 10 (worst possible pain). After 13 weeks of treatment, patients taking duloxetine delayed-release capsules 60 mg to 120 mg daily had a significantly greater pain reduction compared to placebo. Randomization was stratified by the patients’ baseline NSAIDs-use status. Subgroup analyses did not indicate that there were differences in treatment outcomes as a function of NSAIDs use. Study CLBP-2: Four hundred and four patients were randomized to receive fixed doses of duloxetine delayed-release capsules daily or a matching placebo (N=59 on duloxetine delayed-release capsules 20 mg, N=116 on duloxetine delayed-release capsules 60 mg, N=112 on duloxetine delayed-release capsules 120 mg, N=117 on placebo) and 267 (66%) completed the entire 13-week study. After 13 weeks of treatment, none of the three duloxetine delayed-release capsule doses showed a statistically significant difference in pain reduction compared to placebo. For various degrees of improvement in pain from baseline to study endpoint, Figures 7 and 8 show the fraction of patients in CLBP-1 and CLBP-3 achieving that degree of improvement. The figures are cumulative, so that patients whose change from baseline is, for example, 50%, are also included at every level of improvement below 50%. 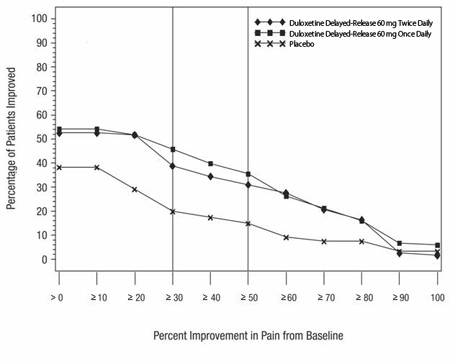 Patients who did not complete the study were assigned the value of 0% improvement.Studies in Chronic Pain Due to OsteoarthritisThe efficacy of duloxetine delayed-release capsules in chronic pain due to osteoarthritis was assessed in 2 double-blind, placebo-controlled, randomized clinical trials of 13-weeks duration (Study OA-1 and Study OA-2). All patients in both studies fulfilled the ACR clinical and radiographic criteria for classification of idiopathic osteoarthritis of the knee. Randomization was stratified by the patients’ baseline NSAIDs-use status. Patients assigned to duloxetine delayed-release capsules started treatment in both studies at a dose of 30 mg once daily for one week. After the first week, the dose of duloxetine delayed-release capsules was increased to 60 mg once daily. After 7 weeks of treatment with duloxetine delayed-release capsules 60 mg once daily, in OA-1 patients with sub-optimal response to treatment (less than 30% pain reduction) and tolerated duloxetine delayed-release capsules 60 mg once daily had their dose increased to 120 mg. However, in OA-2, all patients, regardless of their response to treatment after 7 weeks, were re-randomized to either continue receiving duloxetine delayed-release capsules 60 mg once daily or have their dose increased to 120 mg once daily for the remainder of the study. Patients in the placebo treatment groups in both studies received a matching placebo for the entire duration of studies. For both studies, efficacy analyses were conducted using 13-week data from the combined duloxetine delayed-release capsules 60 mg and 120 mg once daily treatment groups compared to the placebo group.Study OA-1: Two hundred fifty-six patients (N=128 on duloxetine delayed-release capsules, N=128 on placebo) enrolled and 204 (80%) completed the study. Patients had a mean baseline pain rating of 6 on a numerical rating scale ranging from 0 (no pain) to 10 (worst possible pain). After 13 weeks of treatment, patients taking duloxetine delayed-release capsules had significantly greater pain reduction. Subgroup analyses did not indicate that there were differences in treatment outcomes as a function of NSAIDs use. Duloxetine hydrochloride, USP is available as delayed-release capsules in the following strengths:20 mg – Each capsule with blue opaque cap and body, printed with and 2890 on both cap and body in black ink contains 22.4 mg of duloxetine hydrochloride, USP equivalent to 20 mg of duloxetine. Capsules are supplied in bottles of 60 (NDC 0228-2890-06).30 mg – Each capsule with gray opaque body and blue opaque cap, printed with and 2891 on both cap and body in black ink contains 33.7 mg of duloxetine hydrochloride, USP equivalent to 30 mg of duloxetine. Capsules are supplied in bottles of 30 (NDC 0228-2891-03) and bottles of 500 (0228-2891-50).60 mg – Each capsule with gray opaque body and white opaque cap, printed with and 2892 on both cap and body in black ink contains 67.3 mg of duloxetine hydrochloride, USP equivalent to 60 mg of duloxetine. Capsules are supplied in bottles of 30 (NDC 0228-2892-03) and bottles of 1000 (0228-2892-96). Store at 25°C (77°F); excursions permitted to 15° to 30°C (59° to 86°F) [See USP Controlled Room Temperature].Dispense in a tight, light-resistant container as defined in the USP. Information on Medication Guide - Inform patients, their families, and their caregivers about the benefits and risks associated with treatment with duloxetine delayed-release capsules and counsel them in its appropriate use. A patient Medication Guide is available for duloxetine delayed-release capsules. Instruct patients, their families, and their caregivers to read the Medication Guide before starting duloxetine delayed-release capsules and each time their prescription is renewed, and assist them in understanding its contents. Give patients the opportunity to discuss the contents of the Medication Guide and to obtain answers to any questions they may have. The complete text of the Medication Guide is reprinted at the end of this document. Duloxetine delayed-release capsules should be swallowed whole and should not be chewed or crushed, nor should the capsule be opened and its contents be sprinkled on food or mixed with liquids. All of these might affect the enteric coating.Continuing the Therapy Prescribed - While patients may notice improvement with duloxetine delayed-release capsules therapy in 1 to 4 weeks, advise patients to continue therapy as directed. Angle-Closure Glaucoma - Advise patients that taking duloxetine delayed-release capsules can cause mild pupillary dilation, which in susceptible individuals, can lead to an episode of angle-closure glaucoma. Pre-existing glaucoma is almost always open-angle glaucoma because angle-closure glaucoma, when diagnosed, can be treated definitively with iridectomy. Open-angle glaucoma is not a risk factor for angle-closure glaucoma. Patients may wish to be examined to determine whether they are susceptible to angle-closure, and have a prophylactic procedure (e.g., iridectomy), if they are susceptible. ® (duloxetine) delayed-release capsules. However, due to Eli Lilly and Company, Inc.'s marketing exclusivity rights, this drug product is not labeled with that pediatric information. The safety and effectiveness of CYMBALTA have not been established in pediatric patients less than 18 years of age with other indications. The safety and effectiveness of duloxetine delayed-release capsules have not been established in pediatric patients less than 18 years of age with other indications. Interference with Psychomotor Performance - Any psychoactive drug may impair judgment, thinking, or motor skills. Although in controlled studies duloxetine delayed-release capsules have not been shown to impair psychomotor performance, cognitive function, or memory, it may be associated with sedation and dizziness. Therefore, caution patients about operating hazardous machinery including automobiles, until they are reasonably certain that duloxetine delayed-release capsules therapy does not affect their ability to engage in such activities. 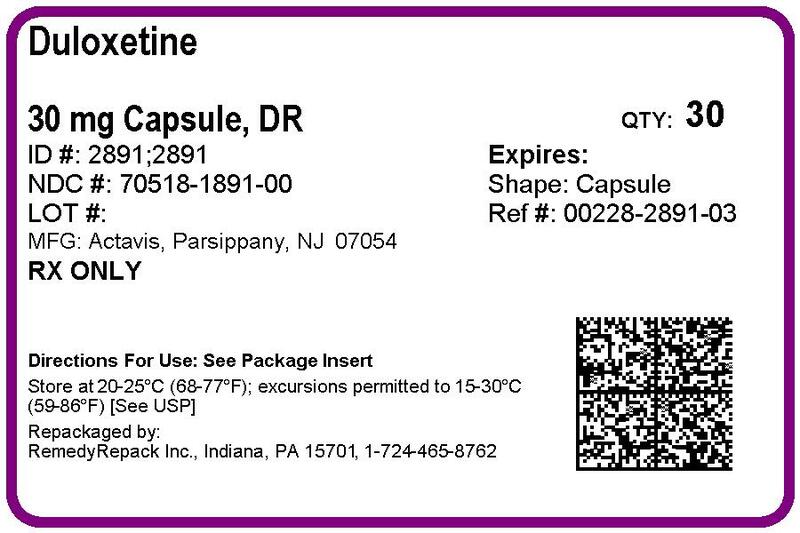 Delayed-Release CapsulesRx OnlyRead this Medication Guide before you start taking duloxetine delayed-release capsules and each time you get a refill. There may be new information. This information does not take the place of talking to your healthcare provider about your medical condition or treatment.Talk to your healthcare provider about:all risks and benefits of treatment with antidepressant medicinesall treatment choices for depression or other serious mental illnessWhat is the most important information I should know about antidepressant medicines, depression, other serious mental illnesses, and suicidal thoughts or actions?1. Duloxetine delayed-release capsules and other antidepressant medicines may increase suicidal thoughts or actions in some children, teenagers, or young adults within the first few months of treatment or when the dose is changed.2. Depression and other serious mental illnesses are the most important causes of suicidal thoughts or actions. Some people may have a particularly high risk of having suicidal thoughts or actions. These include people who have (or have a family history of) bipolar illness (also called manic-depressive illness). 3. How can I watch for and try to prevent suicidal thoughts and actions?Pay close attention to any changes in mood, behavior, actions, thoughts, or feelings, especially sudden changes. This is very important when an antidepressant medicine is started or when the dose is changed.Call your healthcare provider right away to report new or sudden changes in mood, behavior, thoughts, or feelings.Keep all follow-up visits with your healthcare provider as scheduled. Call your healthcare provider between visits as needed, especially if you have concerns about symptoms.Call your healthcare provider right away if you have any of the following symptoms or feelings, especially if they are new, worse, or worry you. In an emergency, call 911.attempts to commit suicideacting on dangerous impulsesacting aggressive, being angry, or violentthoughts about suicide or dyingnew or worse depressionnew or worse anxietypanic attacksfeeling very agitated or restlessnew or worse irritabilitytrouble sleepingan extreme increase in activity or talking (mania)other unusual changes in behavior or moodWhat else do I need to know about antidepressant medicines?Never stop an antidepressant medicine without first talking to a healthcare provider.Stopping an antidepressant medicine suddenly can cause other symptoms.Antidepressants are medicines used to treat depression and other illnesses. It is important to discuss all the risks of treating depression and also the risks of not treating it. Patients should discuss all treatment choices with your healthcare provider, not just the use of antidepressants.Antidepressant medicines have other side effects. Talk to your healthcare provider about the side effects of the medicine prescribed for you or your family member.Antidepressant medicines can interact with other medicines. Know all of the medicines that you or your family member takes. Keep a list of all medicines to show your healthcare provider. Do not start new medicines without first checking with your healthcare provider.What are duloxetine delayed-release capsules?Duloxetine delayed-release capsules are a prescription medicine used to treat a certain type of depression called Major Depressive Disorder (MDD). Duloxetine delayed-release capsules belong to a class of medicines known as SNRIs (or serotonin-norepinephrine reuptake inhibitors).Duloxetine delayed-release capsules are also used to treat or manage:Generalized Anxiety Disorder (GAD)Diabetic Peripheral Neuropathic Pain (DPNP)Fibromyalgia (FM)Chronic Musculoskeletal PainWho should not take duloxetine delayed-release capsules?Do Not take duloxetine delayed-release capsules if you:take a Monoamine Oxidase Inhibitor (MAOI). Ask your healthcare provider or pharmacist if you are not sure if you take an MAOI, including the antibiotic linezolid or intravenous methylene blue. Do not take an MAOI within 5 days of stopping duloxetine delayed-release capsules unless directed to do so by your healthcare provider.Do not start duloxetine delayed-release capsules if you stopped taking an MAOI in the last 14 days unless directed to do so by your healthcare provider.People who take duloxetine delayed-release capsules close in time to an MAOI may have a serious problem called Serotonin Syndrome (see “What are the possible side effects of duloxetine delayed-release capsules?”).What should I tell my healthcare provider before taking duloxetine delayed-release capsules?Before starting duloxetine delayed-release capsules, tell your healthcare provider if you:have heart problems or high blood pressurehave diabetes (duloxetine delayed-release capsules treatment makes it harder for some people with diabetes to control their blood sugar)have liver problemshave kidney problemshave glaucomahave or had seizures or convulsionshave bipolar disorder or maniahave low sodium levels in your bloodhave delayed stomach emptyinghave or had bleeding problemsare pregnant or plan to become pregnant. It is not known if duloxetine delayed-release capsules will harm your unborn baby. Talk to your healthcare provider about the benefits and risks of treating depression or other conditions with duloxetine delayed-release capsules during pregnancy.are breastfeeding or plan to breastfeed. Duloxetine hydrochloride can pass into your breast milk. Talk to your healthcare provider about the best way to feed your baby while taking duloxetine delayed-release capsules.Tell your healthcare provider about all the medicines that you take, including prescription and over-the-counter medicines, vitamins, and herbal supplements. Duloxetine delayed-release capsules and some medicines may interact with each other, may not work as well, or may cause serious side effects. “What is the most important information I should know about duloxetine delayed-release capsules?”Common possible side effects in people who take duloxetine delayed-release capsules include:1. liver damage. Symptoms may include:itchingright upper abdominal paindark urineyellow skin or eyesenlarged liverincreased liver enzymes2. changes in blood pressure and falls. Monitor your blood pressure before starting and throughout treatment. Duloxetine delayed-release capsules may:increase your blood pressure.decrease your blood pressure when standing and cause dizziness or fainting, mostly when first starting duloxetine delayed-release capsules or when increasing the dose.increase risk of falls, especially in elderly.3. Serotonin Syndrome: This condition can be life-threatening and symptoms may include:agitation, hallucinations, coma or other changes in mental statuscoordination problems or muscle twitching (overactive reflexes)racing heartbeat, high or low blood pressuresweating or fevernausea, vomiting, or diarrheamuscle rigiditydizzinessflushingtremorseizures4. abnormal bleeding: Duloxetine delayed-release capsules and other antidepressant medicines may increase your risk of bleeding or bruising, especially if you take the blood thinner warfarin (Coumadin, Jantoven), a non-steroidal anti-inflammatory drug (NSAIDs, like ibuprofen or naproxen), or aspirin. 5. severe skin reactions: Duloxetine delayed-release capsules may cause serious skin reactions that may require stopping its use. This may need to be treated in a hospital and may be life-threatening. Call your healthcare provider right away or get emergency help if you have skin blisters, peeling rash, sores in the mouth, hives or any other allergic reactions. Anxietyirritabilityfeeling tired or problems sleepingheadachesweatingdizzinesselectric shock-like sensationsvomiting or nauseadiarrhea7. manic episodes:greatly increased energysevere trouble sleepingracing thoughtsreckless behaviorunusually grand ideasexcessive happiness or irritabilitytalking more or faster than usual8. visual problems:eye painchanges in visionswelling or redness in or around the eyeOnly some people are at risk for these problems. You may want to undergo an eye examination to see if you are at risk and receive preventative treatment if you are.9. seizures or convulsions10. low salt (sodium) levels in the blood. Elderly people may be at greater risk for this. Inactive ingredients: ammonium hydroxide, black iron oxide, gelatin, hydroxypropyl cellulose, hydroxypropyl methylcellulose phthalate, hypromellose, potassium hydroxide, propylene glycol, shellac, sugar spheres (which contain sucrose and corn starch), talc, titanium dioxide, and triethyl citrate. 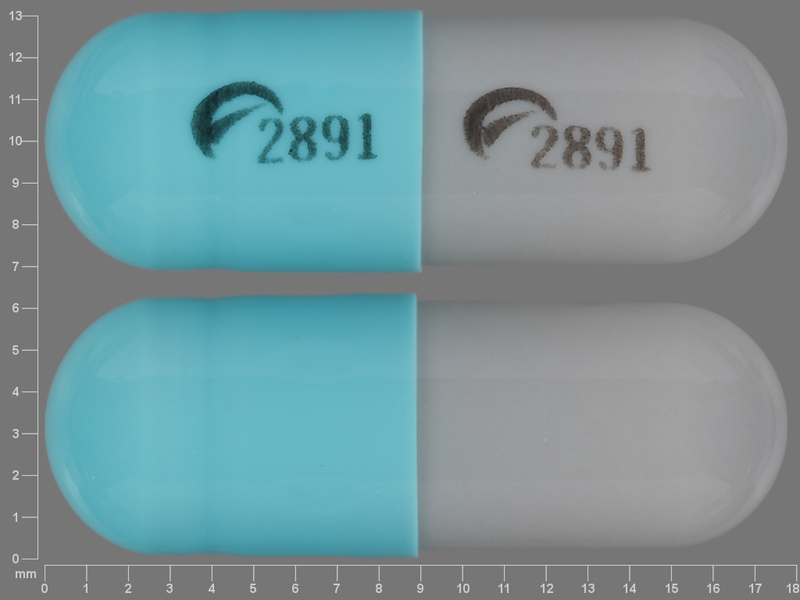 The 20 mg and 30 mg capsules also contain FD&C Blue #1 Aluminum Lake. This Medication Guide has been approved by the U.S. Food and Drug Administration.Brands listed are trademarks of their respective owners.